Paleobotanists generally agree that the early residents of eastern North America cultivated at least eight food plants and one non-food plant before important tropical cultigens—corn and beans—arrived. All of these early cultigens are also reported from prehistoric sites in Iowa. The earliest evidence comes from Late or Terminal Archaic sites in southeastern Iowa and may date as early as 4000 years ago. Evidence from archaeological sites in Missouri, Tennessee, and Illinois, suggest that at least four seed-bearing plants native to eastern North America became domesticated between 5,000 and 3,000 years ago. Cucurbita pepo ssp. ovifera (ornamental gourds and summer and winter squashes), Iva annua var. macrocarpa (sumpweed or marshelder), Helianthus annuus var. macrocarpus (common sunflower), and Chenopodium berlandieri (goosefoot) show morphological changes indicative of domestication. Three other native, seed-bearing plants—Polygonum erectum (erect knotweed), Hordeum pusillum (little barley), and Phalaris caroliniana (maygrass)—lack these morphological changes but are believed to have been cultivated by 2,000 years ago. Domesticated Lagenaria siceraria (bottle gourd), Nicotiana rustica (tobacco), Zea mays (maize or corn), and Phaseolus vulgaris (beans) were later imports to eastern North America. Many of the first cultigens are considered weedy plants, and only sunflowers and squashes, along with corn and beans, remain important food crops in North America today. Squash, corn, and beans formed the historic triumvirate of Native American gardening, although the latter two did not reach the Midwest until late. 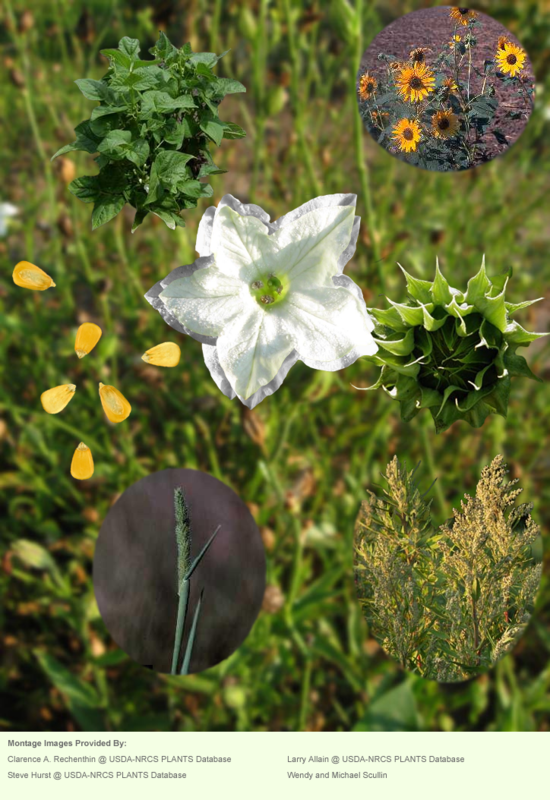 Several other plants may have been cultivated by ancient Iowans. These include amaranth (Amaranthus sp.) purslane (Portulaca oleracea) and panic grass (Poaceae) reported in abundance from widely separate archaeological locations in Iowa. Seeds of barnyard grass (Echinochloa muricata) found at the Late Archaic Edgewater Park Site (13JH1132) in Johnson County may represent a cultivated form. Future research may firmly establish the status of these plants as early crops. Cultivated food plants were harvested from early spring through late fall for their fruits, flowers, leaves, seeds, stems, and oil. When parched, dried, and stored, these same plant products could be utilized throughout the winter. Dried seeds served as a source for the following year’s garden. Plant parts also had medicinal, ceremonial, building, decorative, and utilitarian purposes. Tobacco was primarily used in ceremony and medicine. Late Archaic and Woodland peoples first cultivated early food plants in relatively small garden plots as part of their seasonal round. The beginnings of cultivation were likely an extension of gathering. Plants that thrived in disturbed habitats were encouraged, tended, and eventually planted due to their reliability and scale of productivity. As reliance on cultivation increased, other crops joined the mix, but humans may still have obtained more from hunting and gathering wild species. After A.D. 1000, the addition of corn and then beans inspired a way of life characteristic of Late Prehistoric farmers who created expansive agricultural fields that covered acres and produced abundant harvests stored for year-round use. Such activities remained part of a seasonal cycle, but one changed considerably since cultivation began. Combined with a myriad of wild species, cultivated plants created an economy that was both diverse and complex. This highlights American Indian peoples’ deep understanding of the resources they grew and hints at the efforts they expended to counteract risk—flood, drought, disease, killing frosts, and pests. Such calamities have plagued farmers since time immemorial.